The whiteness of this plant is remarkable and illuminates the dark recesses of our forests. 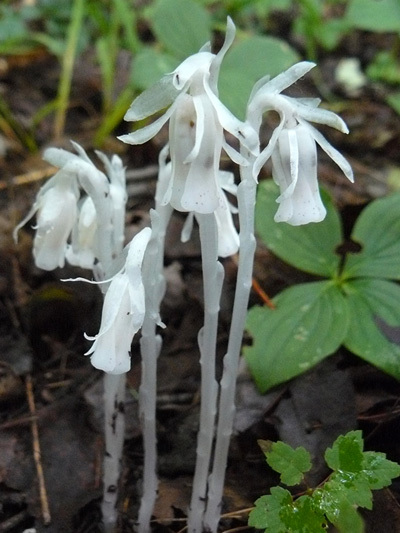 Because of its lack of chlorophyll, Indian pipe, like most fungi, is saprophytic (feeding on decaying organic matter), although the Indian Pipe is a plant and not a mushroom. In fact, the Indian pipe primarily feeds by interfering in a symbiotic relationship between a fungus and a tree, the fungus provides minerals to the tree and it returns him sugar. The Indian pipe is "connected" to this system and benefit from the sugar and minerals without returning anything. Some individuals have a coloration which can vary from pinkish to completely red. At first inclined towards the ground, the flower stands up gradually as the fruit is formed, until fully straighten. The Indian pipe darkens completely after fruiting. Some English common names of this plant are very pictorial: Ghost Plant and Corpse plant, for example. The Monotropa are relics of the Tertiary period (65 to 2.6 million years ago).